For decades managers have been scaling back fisheries without successfully recovering local salmon runs. Our simulation will show you why this hasn’t worked, and let you learn for yourself what will. For about as long as we can remember, the conventional wisdom has been “Fishing must be cut to help recover struggling salmon stocks.” This argument seems sensible, appealing and obvious– which is a big part of why it’s so frequently presented. But the truth of the matter is that this position is dead wrong in the most important cases we face in Puget Sound and around the state. The arguments to cutback fishing are so seductive that even sportfishing advocates can be fooled by this Jedi Mind Trick. Instead, we believe that Washington State selective fisheries have been remarkably well designed in recent years, and are not a significant factor limiting the recovery of threatened stocks in the state. Cutting these fisheries will not in any credible way help recover salmon stocks — and will likely lead to a revenue spiral for WDFW, a net negative for fish. To understand why we say this, we’ve constructed a simulation of a salmon population for you to try out our assertions for yourself. We’ve invented a fictitious river called the “Simulguamish” river — with characteristics not that different from our local Stillaguamish River. Your goal is to recover the population to 20,000 fish (half the Stillaguamish historical highs). 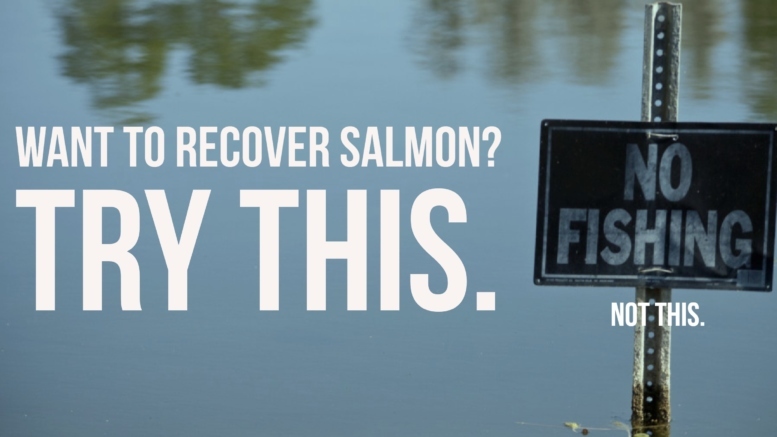 Adjust the sliders yourself and see if you can recover the salmon populations by curtailing fishing… We hope this exercise will help develop your intuition for what the real source of our salmon recovery problems are (hint: it’s not fishing). Simulation notes: The underlying mathematics of our simulation is the Ricker Model, a longtime standard in fisheries management, and one of the important modeling tools used to develop the most recent 10-year Puget Sound Chinook Harvest Management Plan (PSCHMP). While the Ricker Model is a relatively simple paradigm, it is helpful at fostering a clear understanding of the key relationshps driving salmon abundances & recovery. Your salmon run has fallen below the Critical Escapement Threshold of 400 spawners! To define terms — our Fishing Rate slider is what biologists and fishery managers call the Exploitation Rate (or ER). Simply put that is the percentage of the adult fish which are caught and kept, as well as any unintended mortalities resulting from fisheries (recreational, commercial and tribal). As a default we use the PSCHMP Stillaguamish target of 24% total ER, which includes the intercept fisheries in BC (16%) and all Washington State fisheries (8%). The Marine Predation slider is really similar to the Fishing Rate slider — except of course that we’re modeling predation from harbor seals, orcas and other marine mammals as well as sea-birds. Since some of this predation occurs on out-migrating smolts and juvenile salmon — those mortalities are adjusted into what is known as “adult equivalent” values (or AEQ). The AEQ approach recognizes that if juvenile salmon only have a 1 in 10 chance of returning as an adult due to ocean conditions, then a harbor seal chomping on 20 juveniles is equivalent to an orca eating 2 mature returning adult fish. In the end, this is just nature’s own Exploitation Rate. We hear all the time how the problem in Puget Sound is Harbor Seal predation–but we don’t believe it’s blocking recovery. Experiment with the sliders and decide for yourself! Finally we’ve included a Conservation Hatchery toggle switch which allows you to see how vital this facility is on a river like the Sillaguamish. Our simplified conservation hatchery adds a fixed number of 1000 adult fish/recruits to each generation. Like the Natural Origin fish spawning in the river, these fish undergo marine predation and fishing impacts in our simulation. If you try turning off the Conservation Hatchery under current conditions (use [Reset] if you’ve been trying the sliders), you will see the run quickly collapse. It’s an essential facility under current conditions! For a lot of people, it is difficult to understand why the elimination of fishing and predation will not lead to recovery… It even seems at times policymakers get thrown off by technical terms like “Rebuilding Exploitation Rates” which, confusingly, do not (and have not) lead to the rebuilding of Puget Sound stocks. Those Rebuilding ER’s can’t rebuild our runs because as you’ve now seen, fishing isn’t the problem — the river Carrying Capacity is the problem. The first critical difference between salmon and typical Endangered Species (Spotted Owls, Orca and Bald Eagles) is that salmon reproduce only once before dying. Biologists call this behavior semelparity, and it dramatically changes the approach we must take to foster recovery. It’s obvious but bears attention that all returning adult salmon die regardless of if they are caught by fishermen, eaten by marine mammals or survive to spawn. This is profoundly different than the birds and mammals we interact with on a regular basis. Saving a salmon from a fisherman’s net will impede the salmon from spawning once. On the other hand, saving an orca entangled in a ghost net could allow that individual to live and reproduce for the next 30 years. In these more commonly publicized ESA recovery cases, protecting the breeding adults from harm is often the most important conservation measure–but in Salmon recovery the key is typically the health and survival of the eggs/fry/smolt. The second and related difference between Salmon and more commonly discussed Endangered Species is the large quantity of fertilized eggs produced by spawning adults. A single pair of spawning salmon may produce 3-4000 fertilized eggs. With reasonable habitat and ocean conditions it’s not unheard of for that single pair to produce 20+ adults returning to the spawning grounds 3-4 years later. This incredible reproductive resilience means that a small number of salmon are readily able to rebuild a substantial run of fish — provided they have sufficient good habitat to spawn in. Unfortunately, in all the important/threatened local runs of Salmon, we find terrible river conditions for those fertilized eggs. A combination of high sediment loads (logging/landslides), high water temperatures, increasingly frequent flood events (development/impervious surfaces), obstructions (culverts/dams), and urban pollutants conspire to make the rivers tough places for eggs and fry to survive. Returning more salmon won’t help this–they will simply not find places where they can spawn successfully. And in all fairness, we should tip our cap to our co-managers, the Northwest Indian Tribes. They have been right on this habitat point for decades. We disagree with them on a number of big issues — but their position on the link between habitat and recovery is unimpeachable. Does This Excuse Unlimited Fishing? Recent Puget Sound selective fisheries have been well designed and are demonstrably not overfishing our runs. Our stagnant/declining runs are demonstrating acute problems in the habitat. We must educate policy makers and conservation groups about these realities. Co-managers and governmental agencies (hello NMFS and NOAA) need to call a spade a spade and admit the actual cause of our problems lies in the rivers. Then get to the expensive and difficult work of real-recovery — river habitat restoration. Further curtailing fishing will weaken WDFW revenues — meaning less personnel and science available to spearhead the habitat/carrying capacity recovery we so desperately need. All user groups can and should continue to look for ways to further improve their selectivity–especially those groups which have resisted these modernizations (looking at you, gillnetters over ESA runs). Technical Note: At low carrying capacities, our Ricker values for A (productivity) & B (density dependent) are based on an FSA fit of Stillaguamish NOR spawner/recruit data from 1990-2009. This fit puts A at about 1.5. At high carrying capacities, we interpolate A upwards to a maximum of 5, and solve B for the desired carrying capacity. All Ricker computations have a random +/- 10% added to make some affordance for natural variation. 8 Comments on "Fisheries Mgmt for Dummies #2 | Recovery? You Try It!" This isn’t the case on the nooksack river ! This shouldn’t fool anyone into believeing that 9 months of continuous nets in the river has no real impact on the runs. Call a spade a spade well guess what, when the tribes blocked off every river mouth in the north west after the Atlantic’s escaped, what was the tribes catching besides the Atlantic’s??? Is there a written record of their bycatch? Why is it that we as co managers have no access to anything the tribes catch yet they are able to access what the sportsmen catch? It’s clear it always been 1 sided ! I respect that they have fishing rights, but it’s the 20th century not the 1800’s or the 1900’s… The boldt decision needs to be re-evaluated and not one group with a lawyer in this state has the balls to step up and make the tough decision to impact anything…. NF: A couple thoughts: first, it’s really easy to take any serious discussion about the problems we have and throw up our hands and blame nets/Boldt/WDFW. We’ve made a concerted effort to support our positions with the best data we can find — and to that end, we’d suggest you make a WDFW public data requests yourself for tribal catch data on the Nooksack river for the period in question. Maybe there’s a story to be written, and you’ll let us know. Second, in a bunch of ways we wrote this article to challenge exactly the line of thinking you’re on — that cutting fishing (including tribal, which you’re advocating for) will somehow restore our runs. It’s really worth your time to experiment with the simulation above — because for a lot of people it’s kind of a light-bulb thing. When you realize that getting more fish back to the rivers does little if anything to rebuild the runs, it dawns on you that while you may be 100% right to be upset about netting (esp ESA fish) — it’s not the netting that’s limiting most salmon populations in our rivers. Not trying to dispute your claim on netting off entire sections of river, I too think this is ridiculous and I understand your frustration. But, just to give you some background data on the Nooksack itself. A majority of this gillnetting you are talking about takes place after August 16th, that’s now when the Nooksack and Lummi tribes open their gillnet fisheries. The Nooksack has no naturally occurring fall Chinook runs, and never has, those were all hatchery fish. They have a spring run on the NF and a summer run on the SF, yes they intercept a few late summer fish in the lower river, but it’s not a significant impact. The Lummi tribe also has a subsistence and ceremonial fishery in the lower river in the spring using tangle nets for spring fish, they only retain hatchery fish, and account for a 35% mortality rate for wild fish encounters. The Lummi tribe also has hatchery programs from coho and chinook on the south fork, and produce probably upwards o f 80% of the hatchery fish in the Nooksack River. So, if you catch a hatchery coho or Chinook in the fall, it’s most likely produced by the tribe. Habitat rehabilitation is almost all performed by the two tribes on the Nooksack river, predominantly in the SF. They have attempted numerous log jams to try and restore habitat, unfortunately the Nooksack is an extremely volatile system and habitat changes yearly. Something a lot of people don’t know is the SF of the Nooksack headwaters actually use to be the headwaters of the Samish river. The upper Samish was the size of the SF of the Nooksack today. Truth be told, yes the tribes harvest a lot of fish out of that river, but they also are probably doing the most work to recover and restore the Nooksack itself. Why would you want to re evaluate the Boldt decision? Great but how do we compete with our states timber sales? and farmer subsides. as well as developer and industry, all with huge lobbyists. Believe it or not, The timber company’s have made huge strides since the forest and fish forever act was passed. They have spent millions replacing fish blockage and reducing sediment delivery to streams. They have full time employees that do nothing but fish and forest forever act compliance work. And I have seen it working first hand. Excellent learning tool. As with any natural world model, impacts are estimated. The impact I see lacking from this model is our political and governmental impact on fish runs. At times our federal state and local governments find it politically advisable to be seen as helping the fish runs (funds more readily available). Then at times the pendulum shifts back and money is less available. The current federal government shift seems to be towards much less money for fisheries recovery. Hopefully this is an anomaly and the pendulum will shift back. The point is that without consistent funds to apply to improving the rivers, recovery cannot happen on a consistent basis. So a slider for political impact should be provided. I am equally sure that another slider could be added on how those funds are spent. Throwing money at habitat improvement is fine but using flawed techniques or politically driven special projects will significantly impact our efforts to rebuild the rivers and the sound for better fish returns. Our government often finds it expedient to throw up window dressing idea’s, smoke and mirrors as it were. It all sounds good but doesn’t really work. Without a serious concerted and consistent effort by our government no plan can succeed. Lets educate our law makers as well as ourselves. We are writing to thank the authors of the second installment of “Fisheries Management for Dummies,” regarding the many challenges of salmon recovery in Puget Sound and around the state. The article makes it clear there are no silver bullets –multiple strategies must be pursued in a balanced, coordinated way if Washington is to succeed. We appreciate the attention given to the importance of habitat improvements in the recovery of sustainable fish populations. Many people – anglers, tribes, salmon recovery groups, conservation districts,and others – share this perspective and are doing a lot to recover fish populations at risk of extinction. Habitat restoration – and protection of existing habitat – is literally the ground-game of salmon recovery and our fisheries. Unfortunately, the loss of habitat has outpaced restoration for many years, and until we change that trend, our salmon recovery efforts will be too little, too late. As the authors state, it’s true that curtailing fishing and reducing predation by birds and marine mammals won’t by themselves restore salmon populations, but this is where fisheries management gets more challenging. We are investigating what flexibility there may be in existing laws to assist in more effectively managing salmon and steelhead predation rates. Just as we cannot rely primarily on reducing “exploitation” rates to recover salmon and steelhead, neither can we ignore the need to allow more fish to reach their spawning grounds. Here’s the reality facing fishery managers in 2018: We face relatively low projected salmon returns, continued pressure for more fishing opportunities, and new requirements to protect southern resident killer whales approved by the Legislature and Governor in the just-completed legislative session. In this context, it is very likely that fishing opportunities will have to be limited until improvements in habitat protection and restoration, increases in hatchery production, , and enhanced enforcement of fishing and vessel regulations can translate into recovering populations. That’s why we continue to follow the “Four H” approach to recovery – focusing on hatchery production, habitat protection and restoration, mitigation of hydro-power impacts, and managing the harvest of this precious resource. Again, thanks for your attention to the many challenges of salmon recovery.